Former Spiaggia chef Sarah Grueneberg is working on her first restaurant, Monteverde, with a menu highlighting her signature homemade pasta creations. Monteverde, 1020 W. Madison, Chicago, IL 60607, no phone. Celebrity chef Stephanie Izard will open Duck Duck Goat with a menu of Peking duck, dumplings and noodles. Duck Duck Goat, 857 W. Fulton Market, Chicago, IL 60607, 312-492-6262. 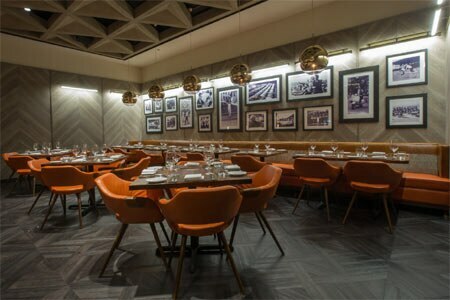 Maple & Ash competes with other newbie steakhouses opening recently, this time in Gold Coast’s “Viagra Triangle” with an open kitchen surrounding a massive, wood-burning grill. Maple & Ash, 8 W. Maple St., Chicago, IL 60610, 312-944-8888. Prolific restauranteur Brendan Sodikoff opened the swanky RH Chicago Three Arts Club Café at Restoration Hardware’s new store inside the 100-plus year old Three Arts Club of Chicago building in the Gold Coast, combining coffee shop, brunch-lunch-dinner restaurant and wine bar on the airy first floor. RH Chicago Three Arts Club Café, 1300 N. Dearborn St., Chicago, IL 60610, 312-475-9116. Successful Canadian chain Earls Kitchen + Bar opened its first Chicago location alongside Yard House in the new lifestyle center near Clybourn and North Avenues in Lincoln Park. Earls Kitchen + Bar, 1538 N. Clybourn Ave., Chicago, IL 60610, 312-929-3952. The first Chicago location for Yard House opened in the new lifestyle center near the Clybourn/North Avenue intersection in Lincoln Park with the go-to menu of pub food and craft beers. Yard House, 1500 N. Clybourn Ave., Chicago, IL 60610, 312-951-7317. ZED451 debuted an all-new happy hour menu Monday-Friday from 4:30 p.m.-7:30 p.m. Highlights include flatbreads, Moroccan chicken, tacos and more. ZED451, 739 N. Clark St., Chicago, IL 60654, 312-266-6691. Dolce Italian in The Godfrey Hotel recently launched a weekend brunch service and an endless Bloody Mary/champagne Bubbles Package ($19), Saturdays and Sundays, from 11:30 a.m.-3 p.m., along with an Expresso prix-fixe lunch for budget-minded, quick workweek lunches. Dolce Italian, The Godfrey Hotel Chicago, 127 W. Huron St., Chicago, IL 60654, 312-754-0700. Balena, located across from the Steppenwolf Theatre in Lincoln Park, now serves brunch on Sundays from 11 a.m.-3 p.m. Look for items like burrata on toast with seasonal fruit conserva; frittata with giardiniera; a porchetta sandwich with avocado, tomato jam and fried egg; and brunch-friendly pizzas. Balena, 1633 N. Halsted St., Chicago, IL 60614, 312-867-3888 . Carriage House will reconcept as CH Bar + Provisions with a more relaxed menu of Southern-inspired eats by chef/owner Mark Steuer, plus classic cocktails. Carriage House, 1700 W. Division St., Chicago, IL 60622, no phone.